Top five tips on writing business communications that customers will respond to. Research, ask questions, talk to customers, fill your brain with facts, figures and knowledge, but there comes a time when you just have to knuckle down and get writing. The first thing you write is unlikely to be anything like the finished piece. But if you don’t start, you can’t finish. I will often start at the top of the page with a factual statement of my purpose in writing. For example: Write 100 words on the history of the company for an audience of people who are just starting out in business. As a journalist, I was used to asking the key questions who, what, where, when, how and why? As a copywriter, I still ask them every day. Most important of all is ‘why?’. Why does a customer want or need this? What difference will it make to them? Answering that question really takes me to the heart of a sales communication. Start with the most important piece of information, then add to it. Try to stick to one idea per sentence or paragraph. Give your audience signposts and make sure the text is easy to read. Bullet points and lists are great for drawing attention to key points. Subheadings help readers skim to the part that’s most interesting to them, or to pick up reading if they’re distracted part way through. It’s not unusual for me to spend longer editing and rewriting than I do writing. In business communications, I’m always on the watch for jargon and cliches. The handy short cuts that may be familiar language in a specific business can be alien or meaningless to people outside of it. So they need to go. Cut big, then cut small. I consider the piece as a whole, then paragraph by paragraph, sentence by sentence before looking at it word by word. I’ll look for repetition, for unnecessary themes or complex phrases and either eliminate or find a better way to say them. It’s easy to get so wrapped up in something you’ve written, that you lose perspective. No matter how tight the deadline, I like to step away from a piece of business writing – make a phone call, get a drink of water and then try to come back to it with new eyes. Not only can this be a good way of spotting errors, but it also encourages me to be critical of my own work. In an ideal world, I shouldn’t have to proof-read my own copy, but in reality, I have to. I use a number of tricks to con my brain into thinking it’s seeing something for the first time. I read it aloud. Start from the end. Turn the paper upside down. Read every word one by one. If I spot a mistake, I look for the one next to it. Does your writing do what you set out to do? Check it against your brief or statement of purpose. Get a second opinion before you publish. Do they understand it? Did they encounter any mental speed bumps? Bits where they had to go back and read it again? Did they spot any errors? Once it’s out there in the big wide world, what can you learn from your customers’ reactions to it? Are there metrics you can measure in terms of responses, awareness and sales? What can you learn for your next successful communication? What are your top tips for successful business writing? Commensality. It’s a word I discovered on Jamie Jauncey’s blog this week. It means sharing a table. Most often in the sense of sharing a meal, which is, as Jamie says, one of the simplest but most profound acts of hospitality. That word triggered off a flurry of associations in my mind, of happy memories of sharing tables. It took me back to Aracena, to sunshine and sunsets where I shared tables with a group of writers to write and eat and uncover things about ourselves. It conjured up an image of a place in the Scottish Borders, my favourite place to swim and cycle with my triathlon buddy. Where, after an active day, you’re sure to be welcomed back to a hearty feast. And where a soppy labrador will put his head on your knee, and give you the eyes in the hope that you’ll one day give in and slip him a slice of cake. It spun into older memories of traditional Sunday lunch at my Nana’s at a wooden table that could be extended to feed hundreds. Roast dinner with all the trimmings, steamed syrup pudding and custard, or apple pie and ice cream. There was always plenty to go round. And then, as it was Father’s Day this weekend, I settled on a memory of another table. Growing up, my family’s dining table was oval and made from smoked glass. We sat around it on white plastic chairs. It was probably the height of chic in the 70s. How on earth it didn’t get broken with three kids running around it, I’ll never know. But it was a good, big space, in a quiet, well-lit room, and so, when the desk in my room felt cramped, or when I deigned to give my sister, who shared it with me, a bit of space, I’d use the glass table for studying. It had plenty of room for my papers, books and folders, and I wouldn’t be disturbed until tea time. When I was studying for my A levels, I remember sharing it with my Dad who, having left school with barely any qualifications, was studying for his Private Pilot’s License. As I wrote reams of notes on Shakespeare, Chaucer, Keats and Wilfred Owen, or puzzled over chemical reactions and equations, he sat opposite with a pile of books, calculations and a slide rule figuring out wind speeds or learning about instrumentation. I’d never though of Dad as the academic type. He was a hard worker, sure, but I don’t think I’d ever seen him pick up a book or read anything other than transport magazines. But he was determined, and more than anything, he wanted to fly. And he did. He’s still flying as often as he can today. Dad’s studies paid off for me too, as in my General Studies A Level exam paper, there was a question all about flying light aircraft. It explained how to move the plane using rudder, flaps and ailerons, and things like pitch and yaw. From the information provided you then had to use a logical process to work out a series of multiple choice questions about manoeuvres in the air. I got an A in that paper. In thinking about tables, I also remembered something I learned when I was in Oxford earlier this year. The word for bank, comes from Italian, banca – a table or bench originally used for changing money. We may think of the world of business and commerce as cold and impersonal, but at its roots, it shares language with the sociable act of sharing a table. A table is a simple, humble object. Its practicality as a place to sit and eat, or write is elevated to a deeper purpose. In sharing food and ideas around it, we share something of our common human experience, and even more of ourselves. How a special writer helped me find my self belief and confidence in my writing. After a pause to give myself a bit of a talking to, I managed to overcome my flight response, drew on my training and race experience and continued to swim, cycle and run my way to the end of the course. It’s a feeling I’ve had as a writer too. That I can’t do this. That somehow, I’m cheating, just pretending, and one day someone will call me out. From what I know of other writers, I’m not alone in this. We all have our moments of doubt. As professionals, we question our worth. After all, anyone can call themselves a writer can’t they? Just as in my athletic pursuits, it’s not just the training and experience that makes me a writer. There’s also a strong element of self belief too. Of believing I can do this. I have the skills, the knowledge and talent. I finally started to really believe in myself as a writer after spending some time with John Simmons. John was director of verbal identity at Interbrand; has written for companies big and small and is a founder of 26. His books include, We, Me, Them & It, Dark Angels, The Invisible Grail and 26 Ways of Looking at a Blackberry, as well as Room121: a masterclass in writing and communication in business co-written with Jamie Jauncey. When it comes to copywriting – he literally wrote the books. So when John Simmons tells you, you are a writer, it’s good sense to believe him. I can think of no greater compliment, or anything else I’ve been prouder to hear. In triathlon terms it’s like finishing first in the World Championships, winning gold at the Olympics and qualifying for Kona all rolled into one. Through John, I’ve developed confidence in my skills and voice as a writer. Felt more assured about asserting the creativity that feeds into the commercial work of a copywriter and opened up opportunities that allow me to explore that creativity beyond the office walls. 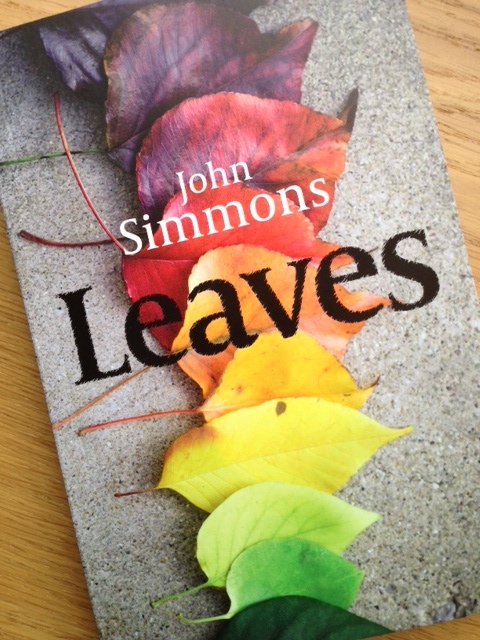 It’s a special day for John today, as he launches his first novel, Leaves. A story he began 45 years ago, now published by Urbane. It’s sad, elegiac and so beautifully written, there are sentences in it that I will read again and again. I heartily wish I was in London tonight to celebrate with him, but distance and demands of my working life mean I can only be there in spirit. Through spending time with John, discussing writing, meeting fellow writers on Dark Angels writing courses and reading his regular, always thought-provoking blog posts, I feel privileged to call him a friend as well as a mentor. A shout from a supporter, or a spectator in a race can make me smile, encourage me to keep going, or stop me from giving in. It’s the same with writing, although generally a little quieter in tone. A simple thank you, ‘nice work’ or even better, a ‘wow’, can really lift my spirits, and encourage me to give my best every time I put pen to paper. This is my biggest distance event of the year. 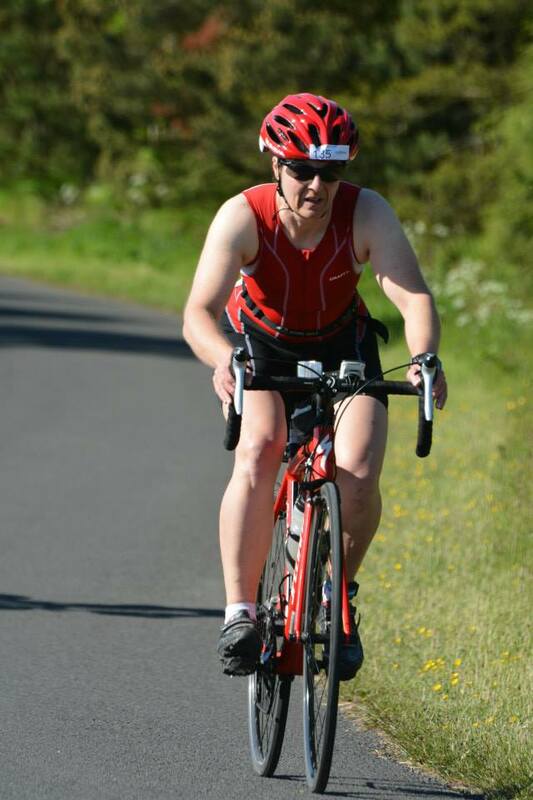 A challenge, that, if all goes well will take me around 3 hours of swimming, cycling and running in the beautiful countryside setting of Druridge Bay Country park. Unlike previous year, it’s my first triathlon of the season. I’ve done no warm ups at Sprint Distance. I’m just throwing myself into the only standard distance event I’m planning to do this year. I really ought to feel more nervous. But I’m surprisingly calm. I’ve done this event twice before. I know the course. 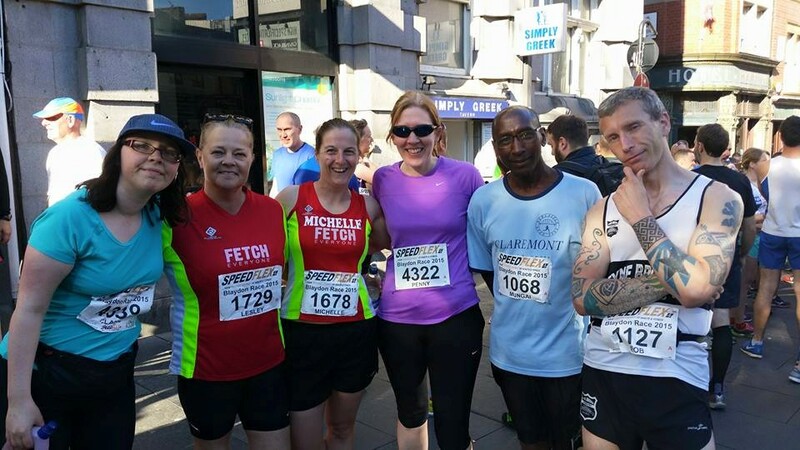 The organisers V02 Max Racing Events always put on a great event and although I’d always like to have done a bit more training, things have been going well with my running and swimming recently, so I feel ready to go. The only dark cloud on the horizon is that my best tri buddy, Lesley, who normally races the Sprint distance here, can’t make it this year as she’s injured. I’m sad that I won’t get the benefit of her cheering me on and having her husband Bob take some great race photos, but I know she won’t want it to spoil my race, so I try to put it out of my mind. I’m up early before my alarm goes off, quickly dressed in my kit and making porridge. Outside I can hear the wind whistling. Not so good for a bike ride. On a positive note, it’s bright, sunny and not too cold as I load up the car and head north to Druridge Bay Country Park. I think through the race as I drive, going through each section and the transitions in my head. I’m surprised at how relaxed I feel. I’m normally a bit more anxious about my first race of the season, and going straight into the big one, I’d expected to get the jitters. Arriving early scores me a good spot in the car park, close to transition and a speedy registration. My only mistake is to forget my Tri England membership card, which means I have to pay for a day’s racing license. 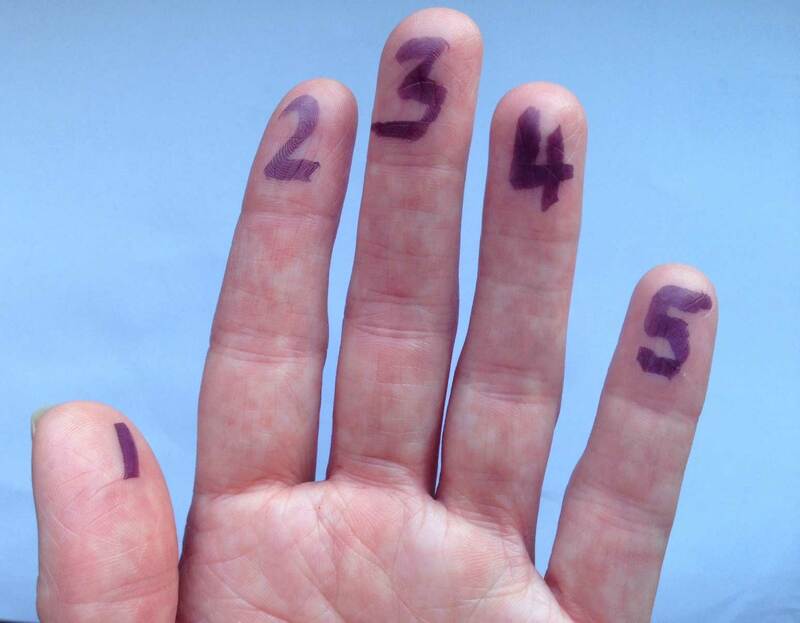 It’s no big deal, but a useful reminder for my next race. Fortunately, I filled a spare before I set off, to sip in the car, in case pre race nerves made my mouth dry. It’s no trouble for me to pop and get it. I’m pleased I can help out a fellow triathlete. I just wonder how my freebie plastic bottle is going to fit on her futuristic bike. But it does. By now, I’m ready to get into my wetsuit. I want to be set and ready for the race briefing at 07:35. Always listen to the race briefing. Even though I know this course, have looked at the instructions and maps, there’s always something you might have missed. Today I realise I’ve been given the wrong colour swim cap, and pop back into the registration centre to swap it. Probably not a big problem in the grand scheme of things, but I like to get things right. I do a bit of an upper body warm up, loosening off my arms and stretching as I watch the start of the sprint race and chat to a couple of women from Blairgowrie in Scotland who are in starting in my wave. Shortly after the mass sprint start, we can get in the water. I take full advantage of the warm up time, to get in, acclimatise and swim a few gentle strokes of front crawl. The water is cold at first. That first icy shock as it trickles down the back of my neck in my wetsuit always makes me gasp. But I acclimatise quickly, thinking how much warmer it is than my first open water swims this year. I place myself out wide from the start, hoping to avoid the worst of the hubbub, and as the hooter sounds, I strike out confidently, avoiding the worst of the melee. This is good. I feel fine. For once I’m happy swimming at the start, and don’t even mind the odd brush of an arm or view of a goggled face close to mine. But as we strike out towards the first buoy, away from the sheltered bank, the wind whips up across the water, pounding it into little wavelets. I can feel my body being tossed around. I get a splash of water as I turn my head to breathe.Bubbles up my nose. Breath starts to come in short snatches. I think I’ve gone off too quickly and stuck myself in the washing machine spin cycle that’s the pack of fast swimmers. I slow down, do a bit of pathetic breast stroke and try to get my bearings.There are a couple of men swimming close by, but I’m by no means in the thick of the pack. I’ve had mental meltdowns on the swim before. I can deal with this. It’s not a crisis, even though one part of my brain is screaming at me to stop, turn onto my back and give up. I have a word with myself. Work out that it’s just the wind making the lake feel more like the sea. And I get my head down and keep moving. It’s still a little patchy. The choppy conditions make me nervous, combined with cloudy water, where you can’t see a swimmer’s feet or body in front of you still a bit nervous. But with a couple more breathers, I make it to the first buoy and turn left around it. I have space now and as I turn at the second buoy and head back towards the swim entry, the water is calmer. I swim more smoothly, remind myself to enjoy the glimpses of blue sky as I turn to breathe and I push on, passing a few swimmers as I go. I may not be the best of swimmers, but I do seem to have the knack of being able to maintain a straight line. This gives me confidence as I glimpse other coloured caps veering away from me. I take sightings every few strokes, but I know I’m on track. Round the buoys again for lap two and back into the choppy waters. Once again, the waves steal my breath, make it feel like I’m fighting the water, using up my energy and making the buoy seem just as far away as ever. I tell myself to get my head in, cut through the chop and try to breathe to the side where I’m less likely to get splashed in the face, but that disrupts my stroke, so I just plough on. Back round the top of the course and the calmer water is a welcome relief from the stress of the waves. But my battles with them have dropped me way back down the field. On the one hand this is nice, as I have clear water all around me, but on the other, it’s demoralising as I’d built up a lot of confidence in my practice sessions at the QE2 lake, and thought I’d be more comfortable swimming with others. Something to keep working on. I strike out for the bank, sighting on the flags, feeling for the soft ground under my feet as I approach the exit point. There’s a definite wobble as I find my land legs again and I’m grateful to the marshals’ hands to help me out of the water, up the grassy slope and into transition. Wetsuit off my shoulders and straight to my bike rack. I get my right leg out, but struggle with my left as I get a shot of cramp through my calf. I sit down and ease it over my ankle and timing chip. Not my fastest transition then, but no matter. Bike shoes, sunglasses and hemet on and I’m off wheeling my bike to the mount line before I can even think about it. I’m surprised to see the Team GB lady in transition at the same time. Maybe my swim wasn’t so bad after all. We’re side by side on the bike mount line, but she’s soon away ahead on her carbon machine as we leave the park. I allow myself to settle on the bike. Easy gear, letting the legs spin a little. Then as I turn onto the main road I start to focus on getting the power down. I take a drink and remind myself to do that at regular intervals, even if I don’t feel like I need it. There’s a small, gradual climb and a cross wind that feels like a head wind as I head out. I’m grateful for it, as it helps dry me and my tri suit out quickly. It’s less fun when a gust feels like it will blow my bike into the kerb. As competitors pass on the opposite side of the road, they look like they’re working hard too. No chance of the wind at my back then. Up towards Widdrington, watching for the little church and the roundabout that’s the first turning point. A marshal shouts that the road is clear behind so I cruise on round and back in the direction I’ve just come. It’s now a long straight road with a nice spot of downhill and a long slog to the next turnaround. At times the wind gusts and it’s hard work, but I keep pushing and trying to keep the cyclists in front in my sights. The bike section is probably my weakest and it’s easy to drift off the pace when I think there’s no one around me. I remind myself this is a race and I need to go hard. 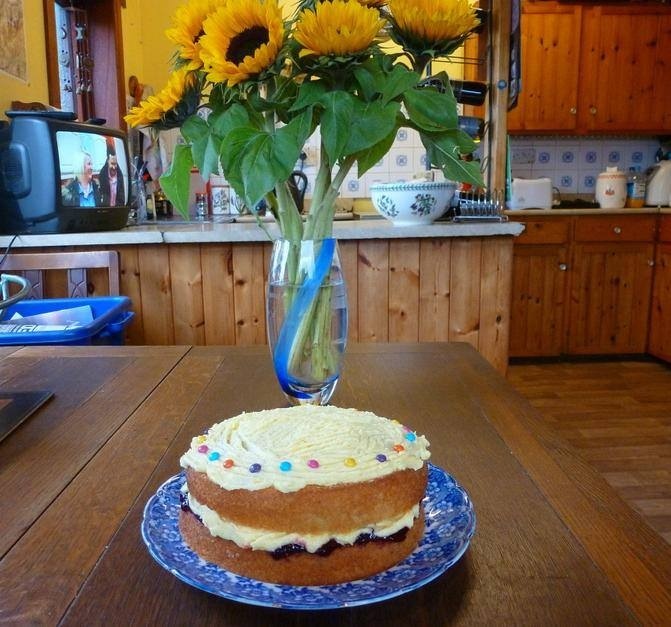 The first time I did this event, the hawthorn or may blossom was blowing across the road like confetti. No such razzmatazz today, but as I pass through the green Northumberland countryside, I ask myself ‘Are you having fun?” And remember to smile. I train hard to do this. It takes time and commitment. But ultimately it’s about enjoying the experience as well as challenging myself. I ride the drops on a couple of sections, feeling the thrill of speed. This year I have a cycle computer that shows me my cadence and it’s good to see it at the 95-100 mark. I take a couple of gels and drink from my bottle about every 20 mins or so. It feels like a lot, but I’ve really struggled on this event before when I didn’t drink enough. My back niggles a bit from being crouched over my bike. I move my hands and shift my weight a little to stretch it out. Through the winter months I’ve been doing some indoor training on a static bike, using Audio Fuel podcasts to add some variety to my workouts. There’s an interval session that I do, which has World Ironman champion Chrissie Wellington providing motivation and tips throughout. Her words ring through my head as I check through my bike form. Yes, I’m pushing down and pulling up on the pedal strokes. My toes are relaxed and spread. I have a light grip on the handlebars and my shoulders are relaxed. Thanks Chrissie… I may not be as fast as you on a bike, but you’re helping me get faster and more confident every time I ride. That helps me through the second lap of the course. And having the cycle computer means it’s easier to stay motivated, counting down the minutes I anticipate I have left to ride. At last comes the sign post and the left turn back into the Country Park. I’ve tried counting the riders behind me, and I’m satisfied that there are enough to mean I won’t be flat last on the course as I was last year. There’s a bit of an uphill and then a fast downhill to the dismount line. I slow down and dismount just behind another competitor and we run over the grass into transition. There are bikes all over the place now, including one in my rack space. I shout out to a marshal and am told to rack just a bit further left where there’s a space. I scrabble to take off my bike shoes and slip into my running shoes. But in transition, there’s no time to think, you just act and go. I high five Jane on the way out. In talking about this race, I’ve said “It’s all about getting to the run”. I’m not the fastest runner out there, but running is where I have the most experience, the bit I know that I can tackle. And now I’m on the run and in no doubt I’ll finish this race. But I can’t feel my feet. It’s like running on iron railings at the bottom of my ankles. My hamstrings and calf muscles are tight as violin strings. Why do I always forget how painful to is to run off the bike? In recent training it’s been a lot easier than this. I just trust to experience and tell myself ‘this too will pass’. I focus on my legs. Think about all the weight and resistance training I do and how strong they are. I try to place my feet lightly, even though I can’t feel them, trusting to muscle memory to keep them running in good form; thinking about picking up my heels and bounding between each brief touch of the ground. ‘Be Alastair Brownlee’ I tell myself. If only. About halfway round the first lap the feeling returns to my feet. I rather wish it hadn’t as I’m gripped with pins and needles. I guess they were cold from the swim and never really got chance to warm up on the bike. By the end of the first lap, I start to feel like I’m running as I should, with no more pain. There’s a small crowd of spectators lining the path and I draw on their shouts. One shouts ‘Come on Michelle,’ but I don’t recognise them. I realise they are shouting for the runner behind me, coming through for the last lap and a fast finish in the sprint race. But I take heart from their cheers. I get another shout as I pass by the visitor centre. I’m not looking, so don’t recognise who it belongs to. 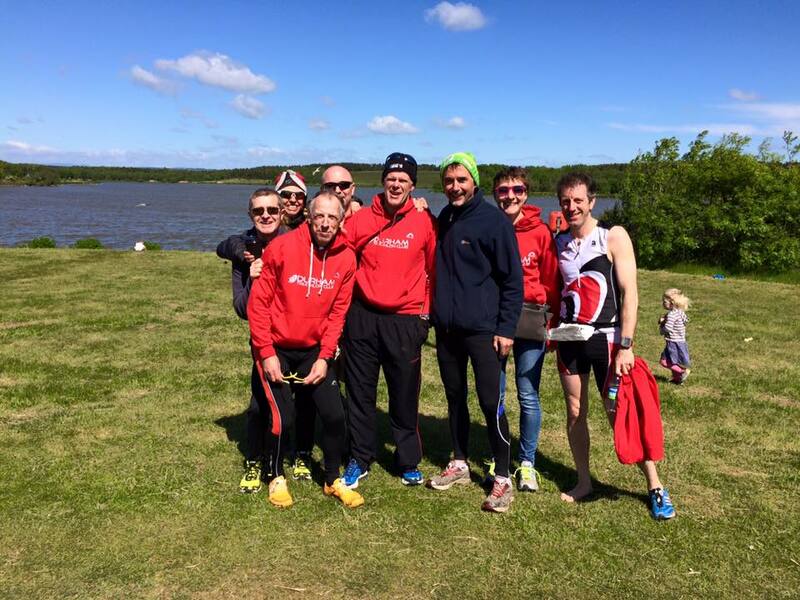 But on subsequent laps I see Peter Brooks, Anne Wilson and their club mates from Durham tri. They give me a shout and cheer on every lap and really lift my spirits. The run route for the standard distance is four laps round the lake. To help me keep track, I make a point of thanking the marshals and saying which lap I’m on at key points. They really have great volunteers at this event. They have to be out for a long time, and it must get pretty boring, but every single one is smiley and encouraging. It’s a great boost for anyone competing. Laps two and three I feel like I’m running well. Not fast, but steady. There’s a little rise around halfway round and in previous events I’ve allowed myself a walk break, but not today. I’ll run every step of this. On one lap a girl I see a girl in a turquoise tri suit take the wrong turn at the top. I manage to find enough breath to shout ‘Left’ and she gets the message and says thank you. 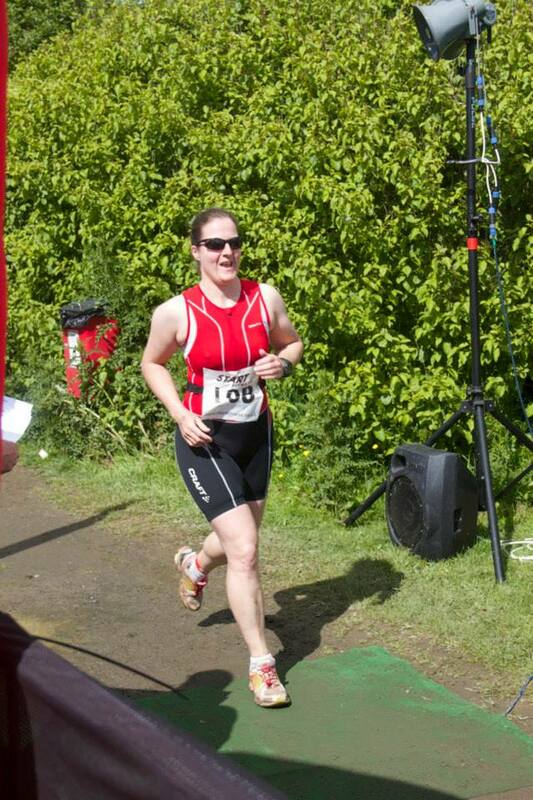 Last lap and round to my Durham tri cheering crew with a smile. But my legs are feeling really hammered now, and I pull on more mental resources to keep plugging away. Just half a parkrun to go. I can do that. And then, there it is. The last thank you to all the marshals. The last time through the pine scented track at the back of the lake. The last time over the bridge and up the slope. And finally the turn into the finish. I push on into a bit of a sprint, but it’s a fairly poor effort and there’s no one close enough to catch. Still, I’m through the archway and finish with a smile. Biggest challenge of the year done! A marshal snips off my timing chip. Another passes me a bottle of water. I stand to one side and remember to stop my watch – 3:14:26. I realise I have no idea how that compares to my previous times for this course. I know I’ve done a faster swim and bike time in the past, so think I’ve probably gone faster before. But given the windy conditions today, I tell myself that a PB would be a big ask. I celebrate with an ice cream and appreciate the free massage even as I yelp at expert hands finding the pressure points in my tight calf muscles. It’s only later, back at home, showered, fed and stretching out my aches and pains that I look through my previous race times. My previous best on this course was in 2013 when I completed it in 3:20:16 – which would make 3:14:anything a pretty big best. I’m only hesitating in declaring it because, at the moment, I only have my own watch for race timing, and I’ll always defer to the official results. Unfortunately I’m not listed on the provisional results yet. So I’ll wait and see. In the meantime, I’ll recover, stretch and hope to ease my aching muscles. I have another race to prepare for this week. 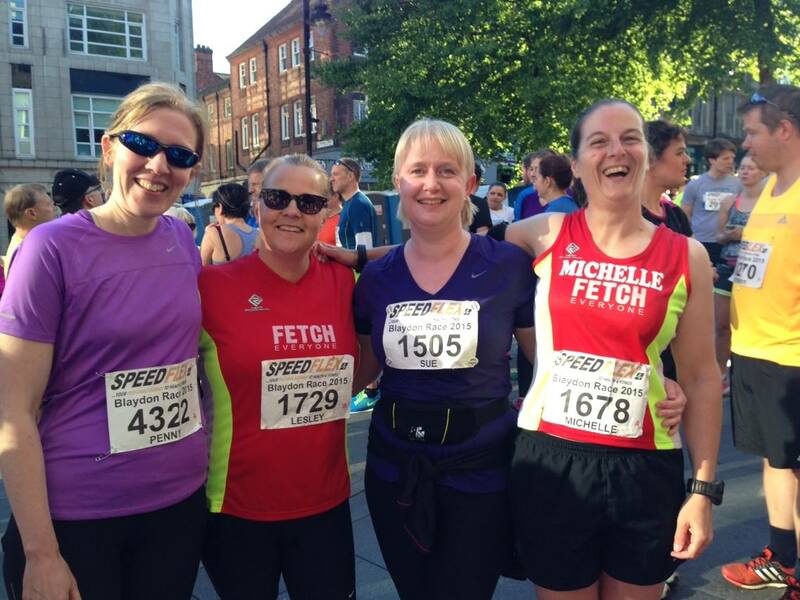 My favourite road race – the Blaydon Race on Tuesday 9 June. Getting to the heart of the brief and how to avoid turning it into a battle plan between client and creative. The brief. The starting point of the conversation between client, creative and customer. These are all things I’ve heard, said or thought myself about the briefs I’ve encountered on creative and writing projects. Hardly the start of a great relationship – one that promises a meeting of minds, sparks imaginations, encourages creativity, and collaboration. And it seems I’m not alone. I was in London today for the first in a series of workshops being offered by writer’s organisation 26, under the title 26 Trade Secrets. 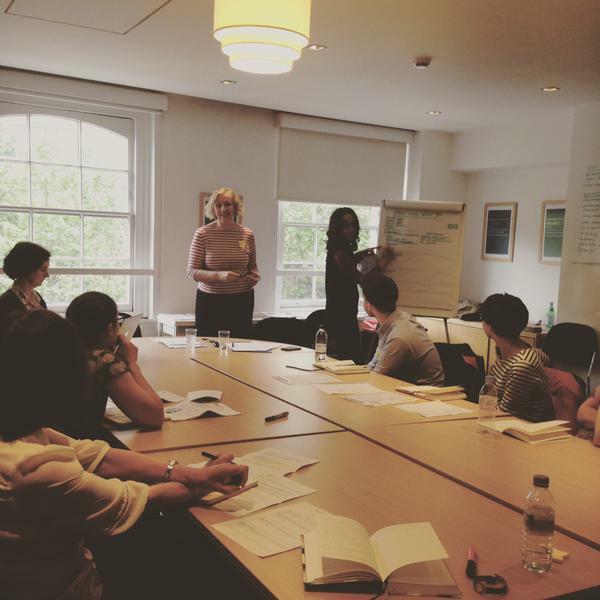 Today’s session at the Free Word Centre in Farringdon was “Setting up Projects for success.” A chance to look closely at briefs, learn how to turn bad ones into good ones and what to do with them when you get them. We started exposing the nightmares. The poor briefs. The confused. The sketchy. The ‘says one thing but really means something completely different.’ Around the room we all had similar stories. A poor brief can become a source of conflict, a sort of battle map, drawing up the lines between them and us. Hardly the best start for a constructive relationship. And yet no client deliberately sets out to write a poor brief. I go back to my clients, ask questions, challenge preconceptions. I worry that sometimes, to a client, it must seem like I’m asking so many questions, I don’t actually want the work. But really it’s about finding the truth of what I’m being asked to write about. As a writer, it’s always good to be able to step into someone else’s shoes. So recently I’ve been trying on the role of client as I work to improve the briefs that we ask them to complete. And it’s really hard to write a good brief. I used an example for a product campaign I’m very familiar with, and still found it tricky to identify what should go in each section, how much or how little information to include and how best to explain it, without lazily copying and pasting from some commercial document. And that’s my job – to simplify, condense an explain things in simple terms. As I also learned, those who write the briefs may not always have training or advice on how to complete them. Or the necessary background information to complete them. No wonder it can be a fraught process. Today, as we broke down and built our perfect brief, there was much discussion about what it should include. But the one thing that stood out for me was clarity. Clear purpose and clear communication. And that requires clear thinking. How much time do you allow to create, interrogate and confirm a brief? 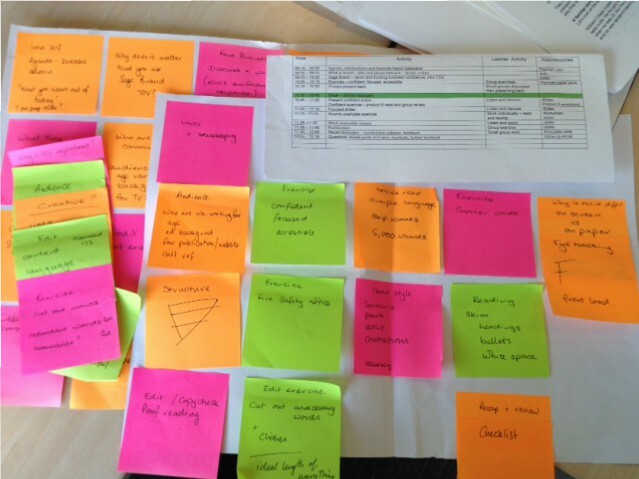 Is it something delegated to a junior team member, a form to be filled in and passed to the creative team to decipher? Or is it not so much a battle plan, as a campaign objective? Something you think about, consider and discuss with the people who need to sign it off? What are your tips for writing a great brief?